I placed my bed at the edge of the map, and slept on it. 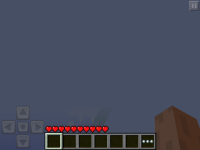 After I died, I respawned at the bed location, however it was so high up I could barely see the ground. Luckily I was able to walk to water nearby to fall safely to the ground.